Rendering of new six story waterslide; Wahoo Wave at Six Flags Hurricane Harbor Splashtown. Spring, Texas – February 12, 2019: Six Flags Entertainment Corporation announced Tuesday that Wet & Wild Splashtown will be rebranded to Six Flags Hurricane Harbor Splashtown when the park opens for their 2019 season. 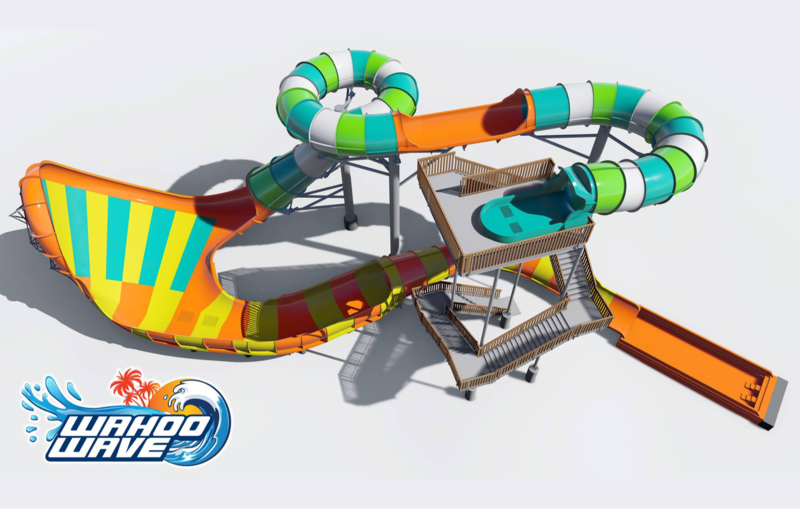 The park will feature a new six-story water slide – Wahoo Wave, along with new Caribbean theme and improvements throughout the park. Wahoo Wave stands six stories tall. This adrenaline-packed adventure sends four riders into near vertical motions to experience extended hang times and zero g-forces. Riders plunge 30 feet straight down before sweeping up at high speeds as they arc across the top of a massive water wall, virtually defying gravity before descending into a refreshing pool below. The 48-acres park, which remains the largest waterpark in Houston, will also feature a new marquee, Caribbean-Inspired theme and custom signage throughout. Improvements also include re-imagined ride entrances, along with dining and retail locations. Six Flags Hurricane Harbor Splashtown opens for the 2019 season on May 4. The park is located at 21300 Interstate 45, just north of Louetta.